Customize quick reply actions to create subscriber segments and more! ShopMessage lets you send personalized Flows and Campaigns to audience segments. You can use User Properties to identify which audience segment your contacts will fall into. These User Properties are determined by quick reply actions, which automatically updates the information ShopMessage is storing about each individual contact. This allows users to self-select their subscription status while your audience segments will automatically be updating! 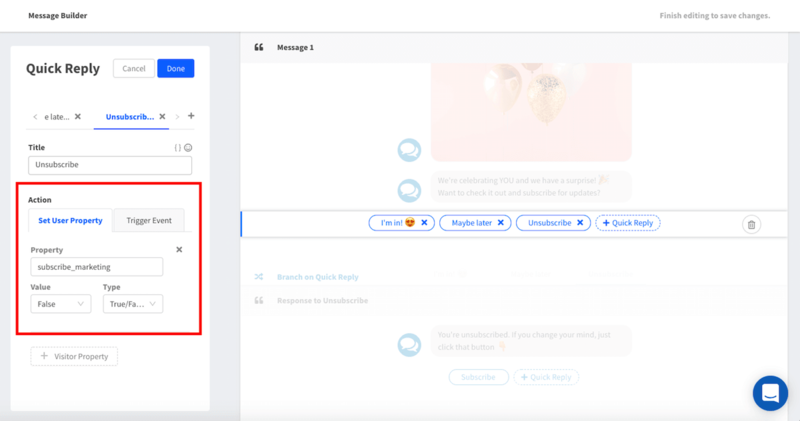 This is important so that you're only reaching users who are interested in hearing from your brand and for tracking how your messages are performing. ShopMessage differentiates between subscribers and unsubscribers by identifying their subscribe_marketing status as true or false . To move someone from your general recipient segment to an unsubscribers or subscribers segment, you'll want to offer them a quick reply that will update their subscribe_marketing status. ShopMessage defines a subscriber as anyone who has their subscribe_marketing status set to true. 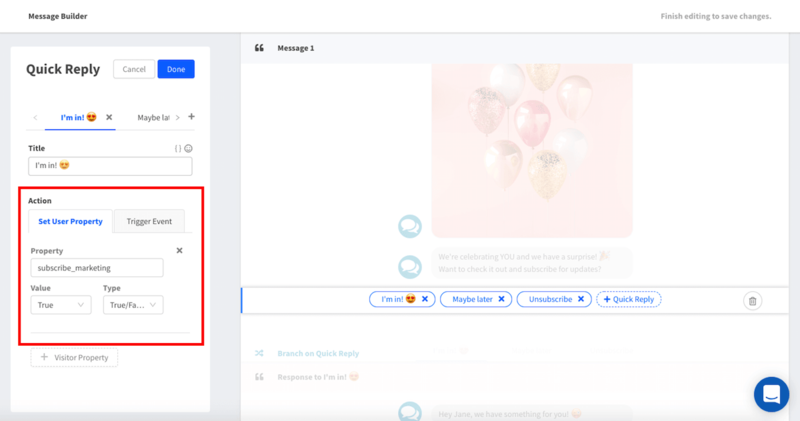 To move someone from your general contact/recipient segment to the Subscriber segment, you'll want to offer them a quick reply that will update their subscribe_marketing status to true. This would typically be the result of explicitly asking a user to subscribe to your brand's messages or by identifying a positive interaction asking for more information. 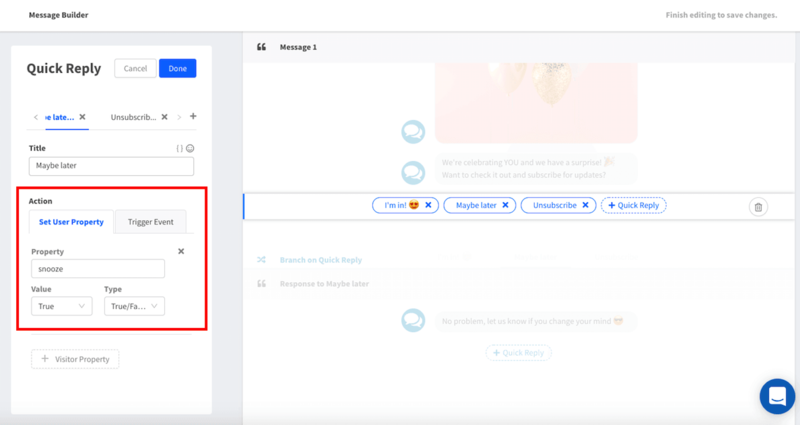 To create a quick reply that would subscribe users, visit the Message editor of the Campaign or Flow that you would like to update. Add new quick replies or update the existing replies in the template. A user who has unsubscribed will have subscriber_marketing set to false. ShopMessage suggests offering users the ability to unsubscribe to improve user experience and ensure you're keeping your Facebook Messenger. 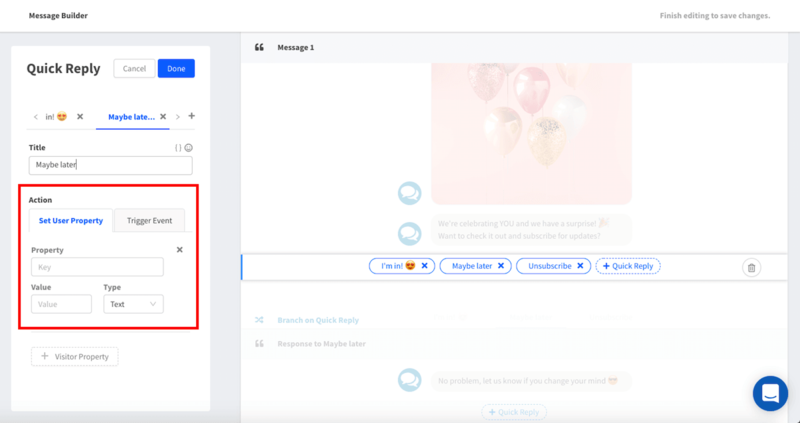 To move someone from your general contact/recipient segment to the unsubscribed segment, you'll want to offer them a quick reply that will update their subscribe_marketing status to false. This would typically be the result of a user clicking a button that explicitly says "unsubscribe". The snooze user property identifies if a contact should have their messages "snoozed" for 30 days. If a user has a snooze property set to true this means your Page will not send that user a message for 30 days (as long as this is identified by your flow or campaign rules). You may choose to set this property when a user is clicking a passive quick reply, such as "not now", "maybe later" or you can even say "snooze messages". You can set your own custom User Properties to store anything you like about your users. For example, you could ask your users a question (eg. what is your favorite color?) and then store these answers in the user's profile (eg. favorite_color = "red" ). You can later use the favorite_color field to segment your audience or even include the values in message templates (eg. send the Red Dress collection to people whose favorite color is red). If you decide that your quick replies should not update your user properties for a certain flow or campaign, simply leave the actions blank!